At the end of this week, you'll be 3 weeks pregnant. The first week started with your LMP (last menstrual period) (see pregnancy chart). In pregnancy week 3, ovulation and fertilization occurs. This is the week that conception takes place, and you are actually pregnant (unlike the first two weeks). But you're not likely to know it yet. Gestation is defined as 38 weeks (from conception to birth) plus 2 weeks. So the 40 weeks of pregnancy starts two weeks before you actually conceive (starting the first day of your last menstrual period). The third week of pregnancy begins with ovulation. The dominant ovarian follicle receives the signal from the hormone LH (luteinizing hormone) to release the egg (oocyte). LH is secreted by the pituitary gland in response to high estrogen levels; estrogen your egg secreted during week 2. The egg is released from the ovary and is swept up into the fallopian tube by the fimbria (finger-like protrusions on the end of the tube). Sperm waiting in the fallopian tube will surround the egg and one lucky sperm will fuse with the egg. Read more about what happens at conception here. Once the sperm penetrates the egg, the two cells become one again; called a zygote. The zygote cell begins to divide becoming multi-celled; now call a blastocyst. First, the single celled zygote divides into two cells, then four cell, then 8 cells, and so on. Even though it has more cells, the size of the blastocyst stays the same. That means that each cell division produces smaller and smaller sized cells. As division continues, it is being pushed down the fallopian tube towards the uterus. This takes about 5 to 8 days. Once in the uterus, it floats around for a couple of days then implants itself into the endometrium (uterine lining) to receive nourishment from the mother's blood. Well, so far you've done everything you can to make this happen. Now comes the waiting game. You've now entered into the two week wait. There's not much you can do to actively help things along. The process is in motion. If you are charting your basal body temperature (BBT), you should see a rise starting the day after ovulation. The rise in BBT is due to the rise in progesterone levels. After ovulation, the empty follicle transforms into what it now called the corpus luteum. The corpus luteum will secrete the hormones that are necessary to prepare your body for a possible pregnancy. Progesterone will further thicken your endometrium by building blood vessels that will feed your little embryo once implantation occurs. After ovulation, during pregnancy week 3, you may notice your cervical mucus has dried up. This is also due to the higher progesterone levels during the luteal phase of your cycle. During the third week of pregnancy, the dominant follicle transitions into a pre-ovulatory follicle and reaches about 20mm in size. The egg has reached the secondary oocyte stage and is ready to be ovulated and fertilized. Only a secondary oocyte will be released from the ovary. After ovulation, your future baby is about 0.15mm in size. A chemical in the outer layer of the egg (once ovulated is called ovum) will attract the many sperm waiting to fertilized it. Only one sperm will be able to fuse with the ovum. Once that happens, the outer layer (zona pellucida) of the oocyte transforms and prevents any other sperm from penetrating it. The two cells (ovum and sperm) become one one complete new cell called a zygote with two nuclei. The zygote will then start to divide its cells as it travels down the fallopian tube to become a ball of cells known as a blastocyst. The cells of the blastocyst will differentiate into two groups of cells. One group (called trophoblast cells) will later form the placenta and umbilical cord. 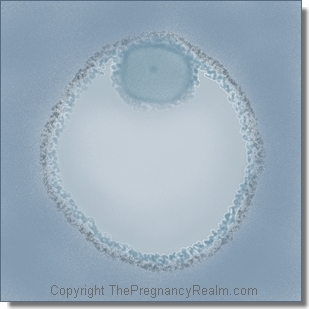 The other (called embryoblast or inner cell mass) will form what will be your baby. In week 4, the blastocyst will 'hatch' from its protective shell (zona pellucida) and the trophoblast cells will then form the attachment to the endometrium for implantation. So, you're now 3 weeks pregnant. Just one more week to go to be able to get a positive reading on a home pregnancy test and find out for sure whether you are pregnant or not. Good luck! !